David Halpern, Chief Exec at the Behavioural Insights Team (aka “Nudge Unit”) has a new blog up about how behavioural science can be used to improve people’s life chances. "Why is it that a Kenyan market seller spends half her profit on money lenders rather than saving a tiny sum each day to escape such debt? Or why does a low income family in the UK or USA spend twice as much on a stove (cooker), bought on expensive hire purchase, than a middle class family?" The thing is, as we know from Branko Milanovic, the country that you are born in matters more for your life chances than everything else combined. 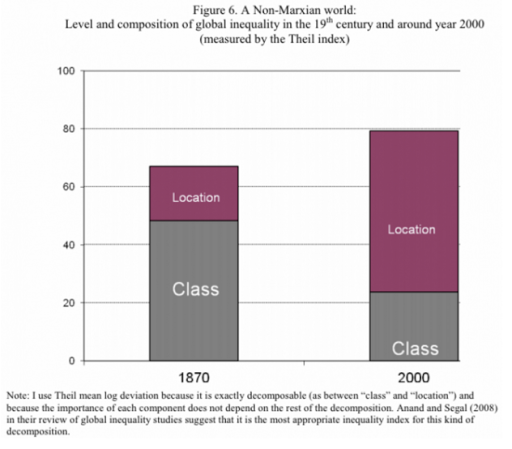 "A proper analysis of global inequality today requires an empirical and mental shift from concerns with class to concerns with location,"
So what does the BIT have to say about the movement of people? As Matt points out, the Home Office is currently paying the BIT to find ways to convince illegal migrants to voluntarily leave the UK. That is, to support the Home Office in its agenda of shutting down the single best way that exists of improving someone’s life chances. Perhaps someone could instead work on a clever “nudge” to make people less scared of foreigners?